In his amazing blog posting a few days ago, Adam Curtis recounts humanitarian interventions since Biafra in 1968, and shows how our assumption of moral clarity is an illusion … is always an illusion. Kouchner quickly discovered that victims could be very bad. There was an extraordinary range of ethnic groups in Kosovo. They all had vendettas with each other – which meant that they were both victims and horrible victimizers at the same time. It began to be obvious that getting rid of evil didn’t always lead to the simple triumph of goodness. Which became horribly clear in Iraq in 2003. At Srebrenica thousands of civilians gathered together in the enclave – believing they were under international protection. But when the Serbian troops led by General Mladic marched in, the UN troops did nothing. The promise of protection had simply made it easier for the Serbs to kill over 8,000 people. … there is a general wariness and nervousness about the return of the old dream of armed intervention. Above all because we realise that humanitarian interventionism offers us no political way to judge who it is we are helping in Libya – and thus what the real consequences of our actions might be. Even if one’s instincts are to help those fighting Gadaffi, it is no longer enough just to see it as a struggle of goodies against baddies. For it is precisely that simplification that has led to unreal fantasies about who we are fighting in Afghanistan and Iraq. Fantasies that persist today, and which our leaders still cling to – because they give the illusion that we are in control. They say China is our banker, but did you know it holds less than a tenth of our outstanding debt? Our public debt – now at around $14 trillion dollars ($14,233,559,283,692.40 as of this writing, to be precise) – has been in the news lately, but how we accrued it, who holds it and whether it represents a problem are not well understood. In one sense, for better or worse, our growing public debt has put trillions into the pockets of the American people. There’s an economic principle known as “Wagner’s law,” which holds that as a country gets wealthier, its tax burden tends to increase. Wagner’s law makes perfect sense: in a poor country, citizens are happy to have a paved road; in a middle-income country, they expect a public school on that road; and in the wealthiest countries in the world, the public expects safe air-traffic control to guide them into an airport where they can catch a cab to a world-class public university. As the expectations of what we want government to do rise, so do the tax revenues that are necessary to pay for it all. Wagner’s law holds true for every country in the world except the United States, where conservative economic discourse prevails. Thirty years ago the Right convinced a lot of Americans they could enjoy tax cuts without losing out on any of the services they’d come to expect. That’s a big part of why our public debt jumped from $997 billion when Reagan took office to over 14 times that number today. We could have paid for everything as we went through higher taxes but we didn’t – in 2008,we ranked 26th out of the 30 countries in the Organization for Economic Cooperation and Development in terms of our total tax burden (the share of our economy we fork over to the government), coming in almost 9 percentage points below the average of the group of wealthy nations. Here are five more fun facts about the national debt. Before the first session of the U.S. Congress came to a close, the public debt stood at more than $75 million, and since that time it has never been paid down. In 1835, we came close – that year, the national debt stood at just under $34,000. The last time the public debt decreased was in the mid-1950s, so every year since we’ve hit a “record high” debt in dollar terms. But a better measure is how much debt we have in relation to our economic output, and that number peaked at around 120 percent of GDP during World War II. The reality is that, as of last year, China held 9.5 percent of our outstanding debt. 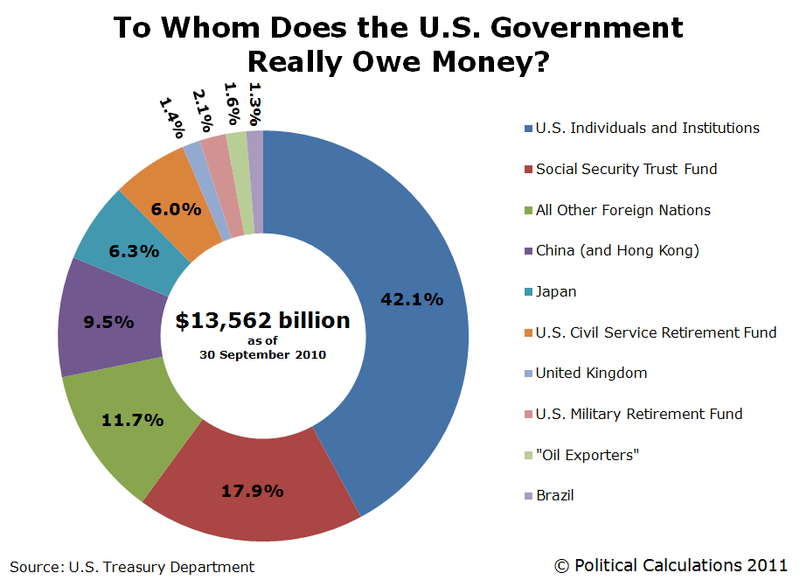 The largest lender to the U.S. government is the people of the United States – we own 42.1 percent of the national debt in the form of Treasury bills held in our pension funds, 401(K)s, etc. And 4.6 trillion – about a third – is held by the government itself. Almost 18 percent of the T-bills outstanding are sitting in the Social Security trust fund, earning interest and making the retirement program incredibly secure despite all the claims to the contrary. Between 1960 and 2010, federal spending as a share of the economy has bounced around within a fairly narrow range of between 17.7 percent (under Eisenhower) and 21.8 percent (during the first George Bush’s term in office). Republicans are just as happy to spend, but they run on tax cuts, and the result is that since the middle of the last century, contrary to the “tax-and-spend” label, it’s been Democrats who are far more conservative when it comes to keeping deficits under control than their Republican counterparts. Ronald Reagan started his term with total debt outstanding of 930 million and increased total debt outstanding to $2.7 trillion. This is a 13.71% compound annual increase. He never balanced a budget. Bush I started his term with outstanding debt of $2.7 trillion and increased total debt to $4 trillion. This is a 10.32% compounded annual increase. He never balanced a budget. Clinton started with total debt outstanding debt of $4 trillion and increased total debt outstanding to $5.6 trillion. This is a 4.2% compounded annual increase. He balanced his last three budgets. George W. Bush started with $5.6 trillion total outstanding debt and increased total outstanding debt to $10 trillion. That works out to a 9.8 percent annual increase – just slightly more than the rate it has grown during Obama’s first years. It’s ironic – or a testament to the influence of the conservative message machine on our discourse – that discussion of the public debt so frequently centers on “entitlements” like Social Security (which hasn’t added a penny to the national debt). After all, we’re still paying for Korea and Vietnam and Grenada and Panama and the first Gulf War and Somalia and the Balkans and on and on. I added up all past deficits (minus surpluses) since 1916 (when the debt was nearly zero), prorated according to each year’s ratio of narrowly defined national security spending–military, veterans, and international affairs–to total federal spending, expressing everything in dollars of constant purchasing power. This sum is equal to 91.2 percent of the value of the national debt held by the public at the end of 2006. Therefore, I attribute that same percentage of the government’s net interest outlays in that year to past debt-financed defense spending. In 2007, when Higgs did that analysis, he came up with a figure of $206.7 billion just in interest payments on our past military adventures. While our public debt has allowed us to violate Wagner’s law, it’s important to understand that we don’t just sell bonds in order to borrow money. When countries with widely traded currencies like the U.S. issue bonds, they are considered the safest investments around, and are therefore issued, and purchased, regardless of the government’s cash-flow needs. Listen yourself to his words here. In Palo Alto, where we lived for over forty years and raised our family, we often felt besieged by fundraising canvassers and petitioners who would travel from cities all over the Bay Area to knock on our door and the doors of other people in this community renowned for being upscale and prosperous, although our decent and quiet little working-class neighborhood rarely felt that upscale and prosperous to us. Jerks from Greenpeace (and only Greenpeace) once even refused to take “no” for an answer and tried to coerce us by saying agressively, “Your neighbors down the block gave generously!” It was tempting to hide out from these assaults, but we usually opened the door and listened politely, occasionally giving what we could to the most deserving causes. In Wisconsin these days, things are decidedly different. I’ve heard stories that residents are running out of their houses and hunting down the petitioners in order to make sure they get their names on the recall petitions. Signature-gatherers in the following video describe the intense passion behind this recall effort. Does this bode well for Wisconsin Governor Scott Walker and his Republican union-bashing minions? Why Did the Universe Create the Human Brain? Here’s the latest music video (“Ode to the Brain!”) in John Boswell’s wonderful Symphony of Science series. I was at first repulsed by this one, since it has many images of the meaty brain exposed outside its skullcage. But then, in a quiet moment, I watched it again and again. You have to work a little bit to see the beauty in the human brain, this wonderful and strange product of over 13 billion years of Cosmic evolution. That’s where the depth of its beauty lies: Our brains — we ourselves — are completely embedded in both Cosmic space and Cosmic time, inseparable from the scale of these dimensions. We could not have appeared much sooner in time, because it required those billions of years of galactic, stellar and planetary evolution to prepare the nest for life on Earth, as well as for our birth as a species. And our appearance in space? It’s beginning to look as though we might have appeared in any of a million places in the universe. And if by “we,” we mean “intelligent life,” then most likely … we have! After you watch this video, it’s worth asking, “What use is the brain? Does our use of it match the consummate beauty and honed perfection of it as an instrument of intelligence? It’s maddening to see the deficit hawks in both parties promote the myth that our biggest challenge as a nation right now is to reduce the deficit. The bipartisan Deficit Commission led by Erskine Bowles and Alan Simpson even promoted Social Security, which has no deficit impact, as a central issue in their deficit reduction scheme. Fiscal prudence matters. But the helter skelter rush to cut this year’s and next year’s budget deficits is high-priced folly. For want of enough spending overall by households, businesses and government taken together, i.e., for want of enough buying, a huge amount of production capacity is standing idle, producing nothing. 13.7m unemployed workers — four for every job that is vacant — are searching for jobs instead of working and earning income. At the same time, states and local governments, forced by shrunken revenues and shrinking federal subsidies to curtail their spending, are shutting health centres, allowing roads and bridges to crumble, and laying off nurses, firemen and teachers. With all that spare capacity, why are businesses not hiring more workers and increasing production? Because their sales people are telling them that there would be no buyers. Debt-burdened households, deficit plagued governments and businesses with a lot of their plant and machines standing idle, are simply not spending enough overall to buy all the goods and services that businesses are easily capable of producing. A trillion dollar per annum shortfall in buying is keeping production by most industries below 2007 levels and the unemployment rate near 9 per cent. And with Treasury bill rates near zero — and core wage-price inflation below target — the Federal Reserve is almost if not quite out of ammunition. If anyone tells you that cutbacks in this year’s and next year’s federal spending will encourage enough additional private spending to make up the difference — never mind how narrow the inherited trillion dollar output and jobs gap — look him hard in the eye and ask him if he’d really bet his children’s tuition money on that proposition. It’s nonsense. Does that notion sound familiar to you? The notion that a reduction in federal spending will automatically result in an increase in private spending? Government cannot inject a dollar into the economy that it has not already taken out of the economy. Wrong. Government debt-based spending is stimulative now and burdensome later, when the burden can be more easily borne. He speaks of private and government spending as if they were competing players in a zero-sum game. At a very deep level, this is an incorrect model of our economic system, in which government supports the commons, the infrastructure, the rules of the playing field on which all economic activity takes place. Business spending is faltering not because it is competing with government spending. In fact, corporations are sitting on trillions in cash reserves. They are not spending their cash reserves because there is not enough demand out there for their products. That’s why tax cuts and other money incentives for corporations right now are crazy. Government has the largest role in creating demand through debt-based spending. In order to do that, it must not fall into the illiterate trap of making deficit reduction its first priority in these hard times. Ms. Rosy Scenario has enjoyed a successful career for the last 20 years as a PR consultant for penny stock gold exploration companies. Before that, she worked in Eastern Europe, where she was instrumental in getting buy-in for the Chernobyl Nuclear Power Plant. Mine Talk: Good afternoon, Ms. Scenario. Scenario: You can call me Rosy. Mine Talk: Rosy, before we start, I have to ask: Are you related to W. Case Scenario, who argued in favor of earthquake safety measures for the Diablo Canyon Nuclear Power Plant? Rosy: Yes. He’s my cousin, but a real pessimist. We disagree on everything. MT: Rosy, with regard to the Idaho Maryland Mine project, what can you tell us about the effect on our underground water supply from constantly pumping water out of the mining tunnels into Wolf Creek, and what can we learn from the disastrous San Juan Ridge Mine that operated for only a few years in the 90’s? Rosy: I’m so glad you asked. Of course, some private wells will be sucked dry, perhaps as far as Colfax, but not to worry. The City will provide ditch water to homes around the mine site. MT: You’ve said that the water pumped from the mine tunnels will be treated before it’s released into Wolf Creek. How will it be treated, and to what standard? Rosy: We’re working on a plan for that. MT: You’ve said that this mine project could create 400 jobs. Where does that number come from, and would these workers be hired from within our local community? Rosy: Although the last time a major mine operated in this area was in the 1950s, there still must be plenty of people in the local community who have all the latest 21st-century mining skills needed for this work. Or, we could bring them in from Nevada. MT: Some critics have suggested that re-opening the mine will result in a net job loss to the community, when you take into account the high-tech businesses that will move out, and those that will not want to move here. How do you respond to that? Rosy: Mining saved Grass Valley during the Great Depression without any high-tech industries. MT: But during the Great Depression, mining represented about 16% of the workforce. Today it would be less than half a percent. Rosy: Well, to paraphrase Margaret Mead, never underestimate what a few committed people can accomplish. MT: The mine plans to dig up a whole lot of rock to crush and treat with toxic chemicals – 20 or more tons for every ounce of gold recovered. Some mining engineers suggest that there may not be more than one year’s worth of gold left in the mine. How can you be so confident that there’s enough for 20 years of operation? Rosy: Just ask our investors! Some of them are still with us after 20 years without a single ounce of gold to show for it so far. Besides, our resource estimates are inferred, not proven. MT: The Editor/Publisher of our local newspaper recently wrote a very compelling op-ed in which he argued in favor of considering the worst-case scenario before proceeding with any large project like this. What would you say to him? Rosy: I’d say this: California environmental regulations are so strict that nothing bad can possibly happen. MT: What about diminished air quality? The Draft Environmental Impact Review (DEIR) lists 10 different acute, chronic, and/or carcinogenic toxic air contaminants, including 20 million tons of CO2 over the life of the project. And the project would emit more than 9 times the ‘significant level’ of nitrogen oxides every day. Rosy: Nevada County is already among the 12 worst counties in the U.S. for air quality. How can 220 twenty-ton diesel truck trips through town every day make it worse? MT: What about the possibility of road accidents involving mine trucks carrying sodium cyanide, explosives, and other hazardous chemicals on City streets and on Highway 49? And, what about the use and storage of cyanide and explosives at the site? What is your plan for preventing accidents, theft, leaks, and spills? Rosy: The mining industry is heavily regulated. We’ll have policy manuals on shelves in the office. Therefore, there won’t be any accidents. Grass Valley is completely safe, unless something bad happens. MT: What about this tile factory? Can the tile factory accommodate 1200 to 2400 tons of tailings every day? And what if it turns out that there just isn’t a market for tiles made of melted mine waste? Rosy. Well, we hope there’s a market. It seems like such a good idea. MT: What if the Grass Valley economy suffers as tourists, retirees and young families flee the town due to the presence of a dirty industrial hard rock gold mine and tile factory within city limits? Rosy: You sound just like Chicken Little “Oh, the sky is falling!” But seriously, trust me. That’s not going to happen. MT: Shouldn’t the mine company pay royalties to Grass Valley? Rosy: You’re such a comedian! MT: Why must Grass Valley rely on a huge new mining operation to clean up the mess left by others on what is now private property? Rosy: It doesn’t need to, of course, but it helps our cause that some people think that. MT: The project sits on top of an earthquake splinter fault within the Foothills Fault Zone. Could blasting deep in the earth increase the risk of subsidence and sink holes? MT: Long term, what will be the effect on our water quality, and thus the health of our community, from burying mine waste back into the tunnels? As it has been explained to me, acid water could form in the mine tunnels when the pulverized rock is buried and comes into contact with water and oxygen. Over time, even low-sulfide ore in the presence of neutralizing minerals will produce acid water, since the neutralizing minerals dissolve at a faster rate. As the mine is located near both surface and groundwater sources, acid water and released heavy metals could pollute both the City’s ground water supply and surface water, in perpetuity. Rosy: We’re not worried – we’ll be long gone by then. We look forward to continuing this discussion with Rosy in the months to come. If You’re a Nevada County Business Person, You Should Oppose the National Chamber of Commerce! What do all these businesses in California have in common? See Bill McKibben’s excellent article describing why thousands of businesses no longer feel they are represented by the national Chamber of Commerce. Though the Chamber claims to represent all of American business, their constituency is really that handful of huge dinosaur companies that would rather lobby than adapt. What if I told you I’d found a political group that for a hundred years had managed to be absolutely right on every crucial political issue? A political lodestone, reliably pointing toward true policy north at every moment. Sorry. But I have something almost as good: a group that manages to always get it wrong. The ultimate pie-in-the-face brigade, the gang that couldn’t lobby straight. From the outside, you’d think the US Chamber of Commerce must know what it’s doing. It’s got a huge building right next to the White House. It spends more money on political campaigning than the Republican and Democratic National Committees combined. It spends more money on lobbying that the next five biggest lobbyists combined. And yet it has an unbroken record of error stretching back almost to its founding. Fast forward to the next great challenge for America. FDR, having brought America through the Depression, was trying to deal with Hitler’s rise. In the winter of 1941, with the British hard-pressed to hold off the Germans, FDR proposed what came to be called the Lend-Lease program, a way of supplying the allies with materiel they desperately needed. As Brad Johnson, at the Center for American Progress, has detailed recently, the US Chamber has opposed virtually every attempt to rein in pollution, from stronger smog standards to a ban on the dumping of hazardous waste. (They’re hard at work as well trying to relax restrictions on US corporations bribing foreign governments, not to mention opposing the Lily Leadbetter Fair Pay Act). If there’s a modern equivalent of World War II, of course, it’s the fight against global warming. Again a majority of Americans want firm action, because they understand the planet has never faced a bigger challenge — but that action’s been completely blocked in Washington, and the US Chamber is a major reason why. They’ve lobbied against every effort to cut carbon, going so far as to insist that the EPA should stay out of the fight because, if the planet warmed, “populations can acclimatize via a range of range of behavioral, physiological, and technological adaptations.” That is to say, don’t ask a handful of coal companies to adapt their business plans, ask all species everywhere to adapt their physiologies. Grow gills, I guess. There’s a reason the US Chamber always gets it wrong: they stand with whoever gives them the most cash (in 2009, 16 companies provided 55% of their budget). That means that they’re always on the side of short-term interest; they’re clinically, and irremediably, short-sighted. They recently published a list of the states they thought were “best for business,” and the results were almost comical–all their top prospects (Mississippi!) ranked at the very bottom of everything fromn education to life expectancy. But that doesn’t mean that business is a force for evil. Though the US Chamber claims to represent all of American business, their constituency is really that handful of huge dinosaur companies that would rather lobby than adapt. Around America, the local chambers of commerce are filled with millions of small businesses that in fact do what capitalists are supposed to do: adapt to new conditions, thrive on change, show the nimbleness and dexterity that distinguish them from lumbering monopolies. As Chris Mead, in an excellent history of the local chambers, makes clear, there are a thousand instances where clear-sighted businesspeople understood the future. Who lured the first movie producers to southern California? The LA Chamber, which sent out a promotional brochure in 1907. Why was the Lindbergh’s plane called “The Spirit of St. Louis”? Because the St. Louis Chamber of Commerce raised the money–that was a pretty good call. That’s why thousands and thousands of American businesses concerned about our energy future have already joined a new campaign, declaring that “The US Chamber Doesn’t Speak for Me.” They want to draw a line between themselves and the hard-right ideological ineptitude that is the US Chamber. Some of those businesses are tiny–insurance brokers in southern California, coffee roasters in Georgia, veterinarians in Oklahoma–and some are enormous. Apple Computer, for instance, which has…a pretty good record of seeing into the future. There’s only one reason anyone pays attention to the US Chamber, and that’s their gusher of cash. But the Chamber turns 100 next year, and it’s just possible that a century of dumb decisions will outweigh even that pile of money. If you’re trying to figure out the future, study the US Chamber–and go as fast as you can in the opposite direction. Bill McKibben is Schumann Distinguished Scholar at Middlebury College and founder of 350.org, an environmental organization running the “US Chamber Doesn’t Speak for Me” campaign. “Scott Walker did not run primarily on a platform of killing public employee unions and becoming a conservative darling. His slogan during the Wisconsin gubernatorial campaign was “Wisconsin is open for business.” He put a premium on attracting new businesses to the state. “No. Right from the beginning, Walker’s cancellation of a high speed rail link between Madison and Milwaukee sent a rail car business out of Milwaukee, abandoning a large factory. The removal of collective bargaining rights from public employees may lead to a serious catastrophe for the state’s forestry industry, as they are likely to lose their third-party “certified market” status.